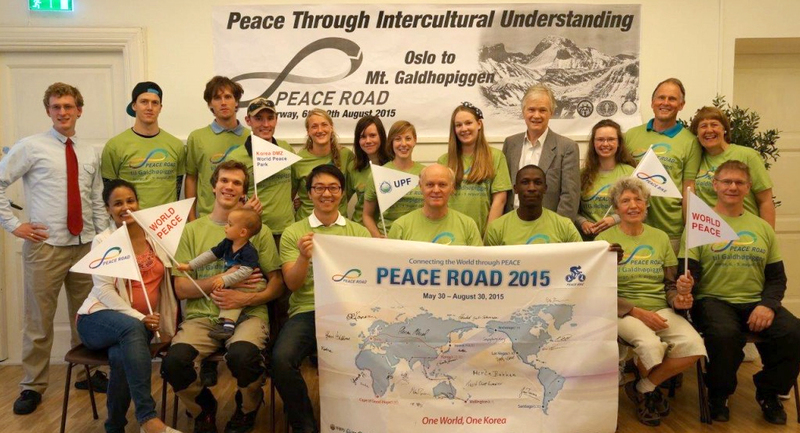 UPF Norway: On August 6 to 9, Norway held Peace Road under the theme “Peace through Intercultural Understanding”, a relevant theme in our society where the government encourages all kinds of dialogue projects. 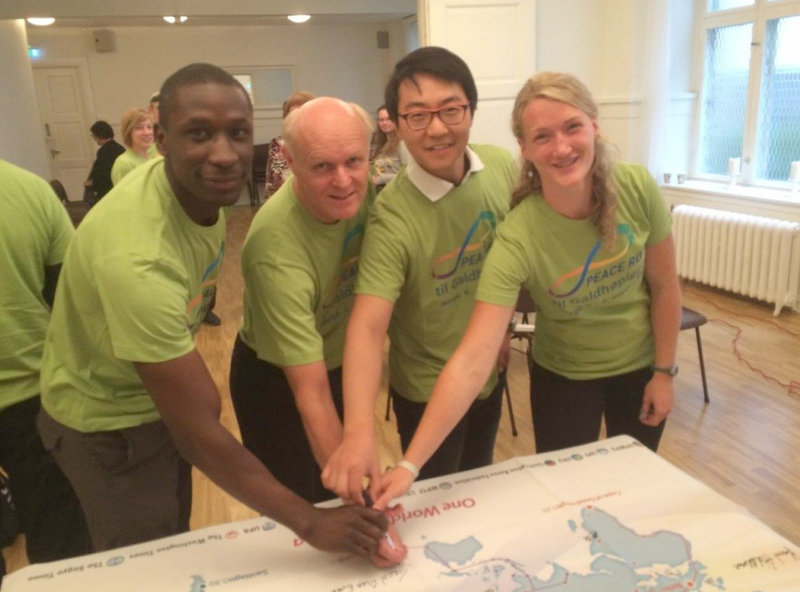 Representatives from 4 continents and 7 nations participated at the launch on Thursday August 6. 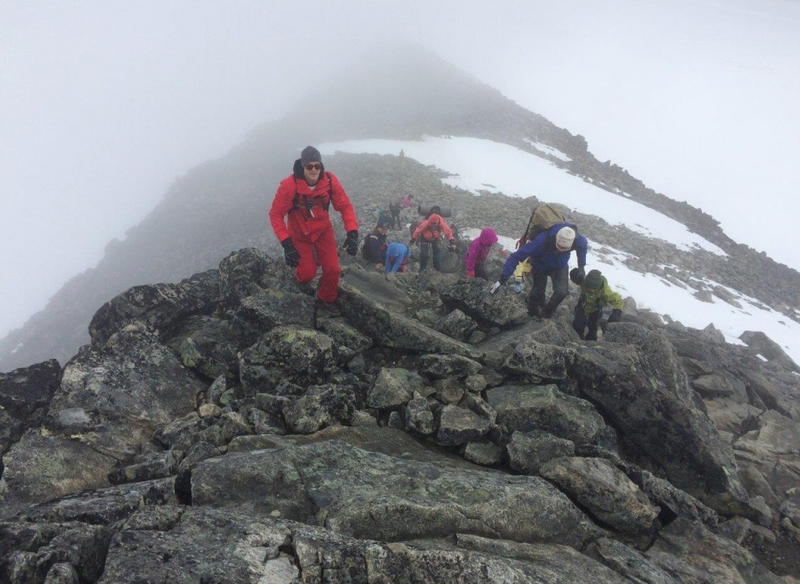 The activity for the Peace Road was to travel by car from Oslo to the foot of the tallest mountain in Norway and from there to climb the mountain peak, Galdhøpiggen, 2,469 meters high. Mr. Steinar Murud, the national leader, explained about the Peace Road and talked about Rev. Moon’s vision of a new international highway and how such a project could bring the world together in a peaceful way. He also asked, “How can a trip to a mountain contribute to peace?” He explained that all progress, even peace, needs a foundation. Without a foundation, nothing is sustainable. Religions always emphasize the need for a spiritual foundation. Upon that foundation, God can give blessings. Our pilgrimage, the Peace Road, builds such a foundation. One American guest in the group responded very well to this point – peace needs a foundation and we are making it. Friday August 7 was the travelling day, 370 km over 5 hours, from Oslo to Lom. 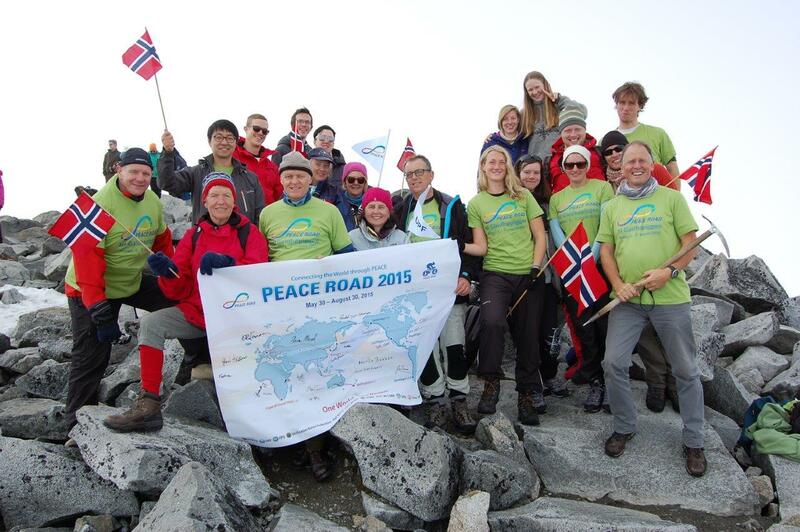 A fleet of cars marked with the Peace Road logo transported the 21 selected participants to the base camp. On Saturday morning, the Peace Road team woke up to sunshine and a welcoming rainbow which they interpreted as a good sign for the mission ahead. 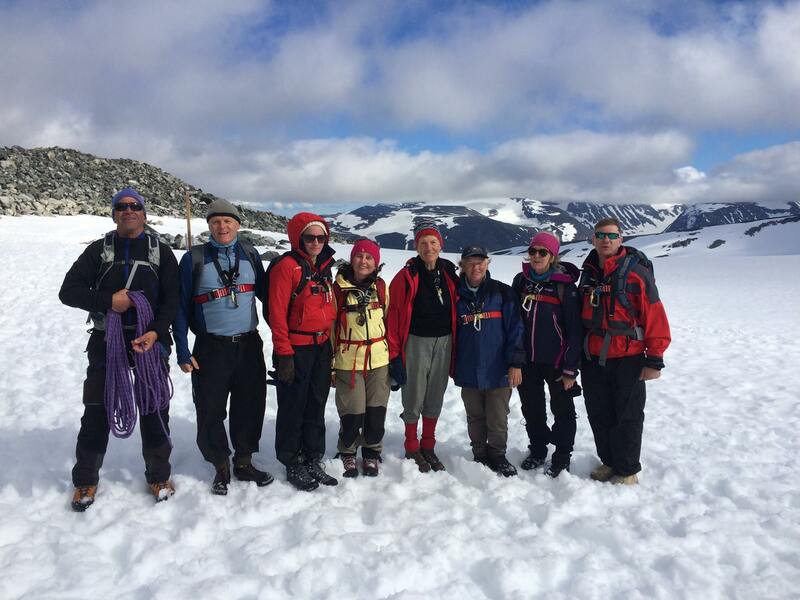 21 participants, between 17 and 72 years old, set out on the 4-hour climb with a professional guide. 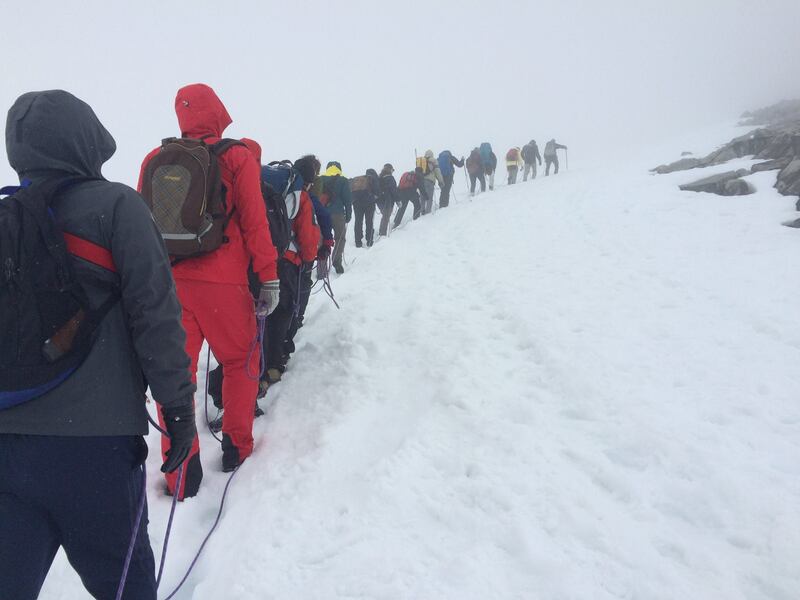 At one point, they crossed a glacier, walking single file, connected with a rope. After this, the path became steeper and steeper, crossing hills with large, challenging rocks and finally a steep area of heavy snow that drained the last energy from most of them. Reaching the top was a true relief. After eating lunch packs, they needed to start the program even though one participant was still lacking. Even our guide was sure he would not make it to the top. However, when the team started to gather, a shadow appeared in the fog and there he was the 21st participant. He later said he had never been so exhausted but at the same time he would never forget the experience. The national leader offered some words at the end of the pilgrimage. As an expression of this event everyone sang; Urie sowonun tongil, loud and with confidence from the highest point in Northern Europe. Other climbers at the top were watching and applauding. Finally there was a group photo with the banner which had been signed at the launch. The evening finished with a nice celebration dinner at the base camp with reflections and many songs. One guest expressed how proud he was to have taken part in this project for peace. For all of the participants, Peace Road was really tiring for the body, but very reviving for the spirit. Participants didn’t think they could have brought the Peace Road any higher than they had.